Replacing hold-time with a call-back (a.k.a. call-back software) can be an extremely effective way to solve a number of problems that negatively impact call-centers. Call-backs can lower abandon rates, smooth out call volume spikes, improve the customer experience and reduce telco costs. In the case of call-backs one-size doesn’t fit all, so a successful deployment requires a deeper understanding at the root cause of the issues. Accordingly, here are 5 best practices to consider when implementing a call-back solution. As the saying goes, “the first step is to admit that you have a problem”. For call center managers, this is easier said than done, as they’re often overloaded with quantitative data, staffing issues, long-term initiatives, budgeting issues … the list is exhaustive. Sometimes asking the simple questions can cut through the noise. For example: Are long hold times a problem in your contact center? Do you have high abandon rates? Do you have volume spikes that are hard to staff up for? If you answered yes to any of these questions, it’s time to consider a call-back solution. Of course that’s not always the case. With the pervasiveness of SaaS solutions in recent years, a growing number of organizations have discovered the advantages of replacing on-premise equipment with cloud-based services. Whether your call center is on-premise, cloud, or a mix of both, there are call-back solutions that will successfully integrate with your infrastructure. There are even solutions (like Fonolo) that will work in any environment, regardless of your architecture. How early is early? That depends on when calls are abandoned. A successful opt-in rate to a call-back offer (e.g. “Press 1 to get a call from the next available agent, and we’ll hold your place in line”), requires informing callers well in advance of the average abandonment time. For example, if customers abandon at 60 seconds, you may want to offer them a call-back within 30-40 seconds, to coincide with their growing frustration level. Many companies offer a call-back early in the queue (i.e., right as a caller is placed on hold), however this is often ineffective unless the offer is repeated at regular intervals. In many cases callers tend to ignore informational messages (e.g. “the wait time is longer than usual”, “your call is important to us”), so offering the call-back message when they grow impatient is the most effective way to underscore its usefulness. It sounds like an odd question, but do you know where do your calls originate from? Traditionally, companies have used TFNs (toll-free numbers) for tracking purposes; allowing them to reconcile what sources (or marketing campaigns) have resulted in inbound calls. What about calls originating from the web, or mobile applications? Surprisingly, few of the companies we work with know the call volume from the published phone number on their website. Even fewer (virtually none) know how many calls come from customers using their mobile app. Understanding the source of call traffic is key- not just for marketing purposes, but for the management of call volume as well. For customers on the web and mobile, it’s a huge step back to phone a contact center and wind up on hold – one that significantly diminishes their customer experience (especially given the pervasiveness of self-serve tools and alternate channels, like chat and social). Offering customers a call-back right from your website or mobile app from a Visual IVR interface or a Click-to-Call-Back component offers a greatly improved experience. This approach allows customers to escalate to voice directly from their preferred channel, while still allowing them to avoid getting stuck on hold (they get a call-back when an agent is free). Nothing slows down a call like having to ask repetitive questions. With CTI, CRM and agent desktop software in place, there’s no reason agents can’t be properly prepared for inbound or transferred calls. When implementing call-backs, companies have an opportunity to go a step further. Asking pre-call questions that might not be a part of the IVR (or, for calls originating via web/mobile), agents can be even more prepared for a call, further reducing handle time (for example, by asking “what’s your name and account number?” or “what’s the reason for your call?” and passing that to agents, in advance of the call). The right call-back solution can be a veritable Swiss Army knife for your call center, allowing you to offer enhanced functionality at a very reasonable cost. 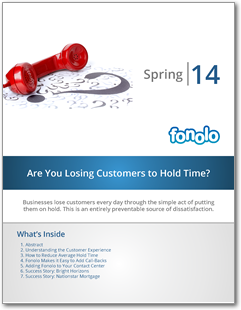 Free Whitepaper: Are You Losing Customers to Hold Time? Download our free whitepaper and learn about the best way to eliminate hold time and improve the customer experience.